From Ida Shuler: "All I do is think about how brave this little girl was, how this little girl managed to hold onto her dreams despite the challenges she faced! I use to be selling sugarless kool-aide and old halloween candy on Alexander St in Newark! Playing school in my best friends’s basement because teaching made me happy and it suppressed my reality temporarily...I would literally cry out to GOD because I didn’t want to boil water every night to take a hot bath and questioned GOD why I had to live like that! Because of her I’m EVERYTHING I am today resilient, motivated, inspirational, hardworking, one Bomb momma, dedicated, GOD FEARING, loveable, crazy, crafty, talented, smart... because of her the devil can NEVER steal my joy... growing up I had no real role model... my 8yr old self is the person I admire the most... at such a young age I knew my trials and tribulations was only temporary and here I am today! One day I hope I’ll get a call from one of my students expressing how I inspired them! 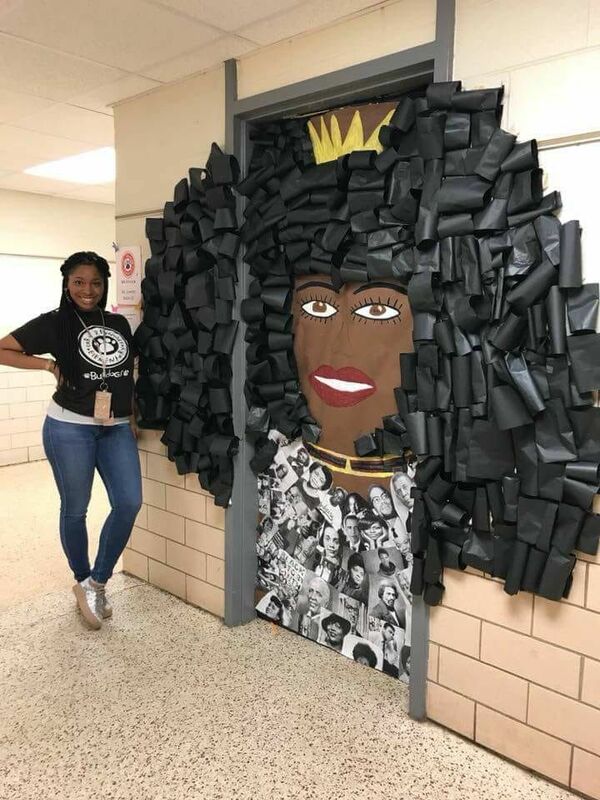 My older cousin is an elementary school teacher and this is how he decided to decorate his door for Black history month! This is so dope! Our classroom door is complete. My first graders read and learned all about Brave Ruby Bridges and wrote about how they have been brave like her. I always kick off black history month by sharing the story of Ruby Bridges because it is one that I feel that my students will identify with. . . Ruby Nell Bridges made history as a six-year-old entering first grade in 1960 when she became the first African American student to desegregate a formerly all-white school in New Orleans. . . My students had fun crumbling up the paper to make her hair.